I made a Valentine this morning for the Speedy the Cat's Friends challenge #37 found here. 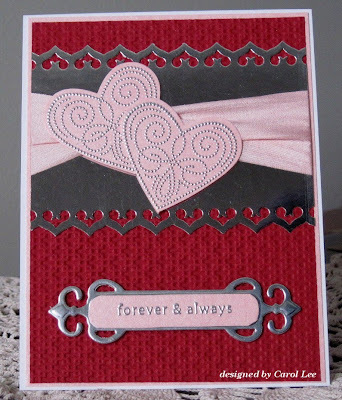 Geri's challenge this week is to use embossing on our cards. I used dry embossing along with heat embossing for this one. I couldn't get a good photo of this card because I used some silver metallic cardstock and no matter how I positioned the card or the light, the reflection blurred the card every time. I decided to use natural daylight to avoid that glare, but guess what? It's snowing here in PA today, so this is the best I can do! LOL I used the SU! square lattice ef for embossing, along with the SU!Polka Dot Punches heart, which was embossed with silver ep. I used a piece of silk ribbon beneath the hearts and I really wanted to make a big bow, but it drowned out the hearts, so I left it as is. Because it's flat, this card won't need extra postage for mailing and I like that! I used an EK punch for the border on the silver panel and a Spellbinders die for the SU! sentiment. Pink, Red, and Silver.......I'm kind of liking this color combination! Have a great weekend, stay warm, and thanks for stopping by. I might have more later since it's a stay-in kind of day. What a stunning card! Love how you did your hearts. Thank you for playing with Speedy's Friends. Pretty details..love the colors. Today I am going to stamp all day!!! Maybe I will get something posted! Another beauty, Carol! Yup, more snow. Want to go sledding later? LOL! If ya get a chance, check out how I cased Wendy's journal. Hugs! Oh Carol....girl this is amazing! I love how you used the metallic cardstock on this and all the little details! I bought a bunch of that metallic paper when i was back in PA at L&L so I have it. I love the look of it on cards. I got quite a few Christmas cards made with it and it packed such a punch! Your card is the same! More snow, huh? Calling for it here tomorrow & Monday but we'll see but it's always good to stay in and stamp tho, right?? Have a great Saturday, sweetie & stay warm! This is so beautiful and elegant, every little detail is perfect. Thanks for sharing with us and for joining Speedy's Friends this week! That looks awesome! your embosssing is perfect- great job! What a stunning and elegant valentine! Thanks for playing with Speedy's Friends! Your photo is terrific - I can tell you embossed and it is a beautiful valentine! Thanks for playing with Speedy's Friends! WOW! WOW! WOW!! I love this!!! Absolutely perfect! Thank you so much for sharing with us at Speedys Friends.